Between May 10th - July 1st, 2017 our Love Your Lake volunteers picked up over 31,000 pieces of rigid plastic off the shores of Lake Ontario. Jennifer has sifted through all this plastic to carefully select pieces to be used in her Lake Ontario themed art pieces. 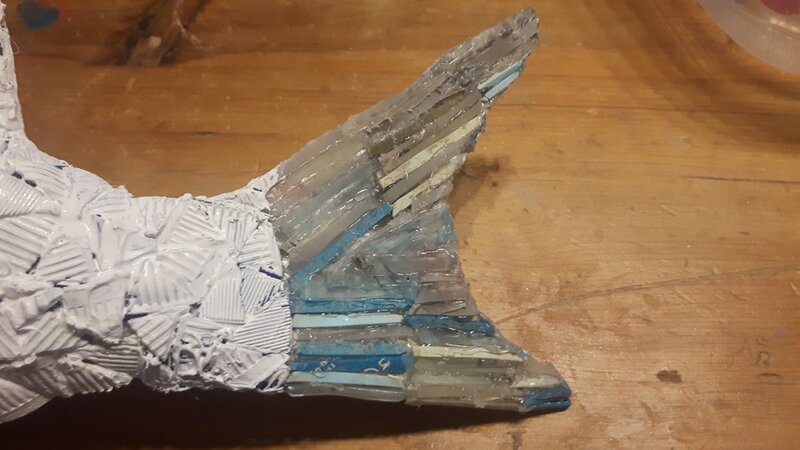 Each piece tells a story that connects Lake Ontario, people, and litter. New pieces will be added monthly leading up to next year's Love Your Lake project beginning in May 2018. A very special thank you to Jennifer Richardson, our art intern, for creating the beautiful work featured in this gallery. This piece is about hundreds of years worth of hunting and fishing on Lake Ontario. The Lake has been enjoyed by generations and in the beginning there wasn't a visible impact on the Lake. With the invention of plastic we can now see the evidence these recreational sports leave behind. Not only are plastic fishing line and shotgun shells washing up on shore, they are also entangling and choking wildlife. This beautiful duck decoy art piece was started by putting paper mâché over a female mallard decoy. Pieces of shot gun shells from the shores of Lake Ontario were cut and glued on top then washed with a coat of paint. 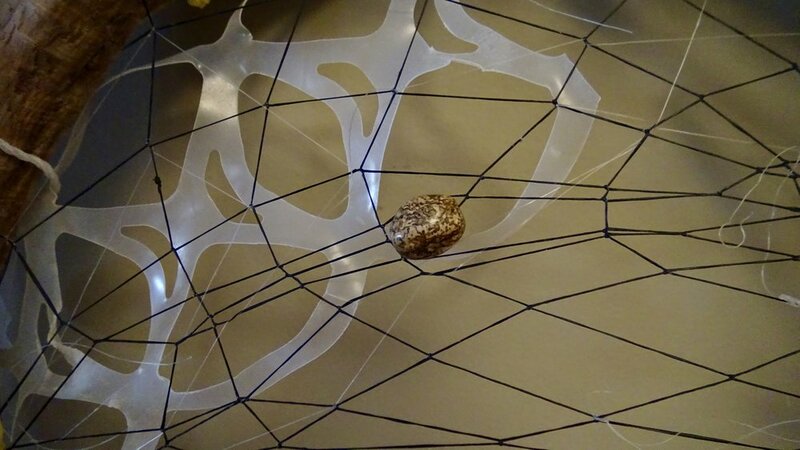 The nest was created by a mass of tangled fishing line picked up off the shore in Prince Edward County. Bits and pieces of garbage from our daily life was added in as a reminder that these are now items that wildlife live next to in the wild. Instead of passing on the tradition and skill of hunting and fishing to the next generation we're leaving a tangled mess of plastic and declining wildlife populations. Thank you to all the hunters and anglers who enjoy their sport responsibly. This dream catcher represents the first peoples that called the shores of Lake Ontario home. At one time, before the invention of plastic and single use products the Lake was clean, pristine, and used daily for the survival of our First Nations. Litter now occupies the land and water that was once utilized and cared for by historic lakeside tribes. Lake Ontario once had clean, prosperous dreams but is now part of a littered nightmare. The fishing line was pulled out of Lake Ontario along with the plastic rope, bucket handle, shipping tags, six pack ring, fork, faux foliage, and white helix. Natural driftwood, a stone and feathers have been added to represent the original natural aspects of Lake Ontario. These pieces can still be seen in nature although they must now compete for space with all the plastic that has accumulated. Remember less is more, less waste equals more space and protection for our natural areas. Lets make some good dreams come true for the future of Lake Ontario. Somehow the lure and beauty of nature can cover up the fact that we're neglecting it. When we enjoy a nice campfire by the lake the last thing we're thinking about is the litter and pollution, but it's there. We push it to the back of our mind. Our ignorance and avoidance isn't going to fix the problem until one day when we show up at the beach and we are met with too much garbage to even set up camp. Jen started this project out with an old record, a turntable and some paint. 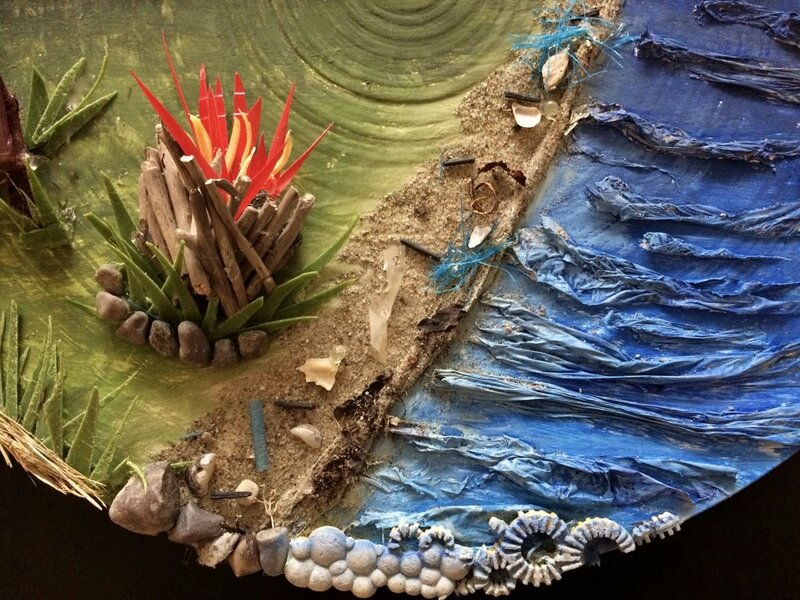 The rest of the work is 3-D and made of plastic and litter found on the shores of Lake Ontario. 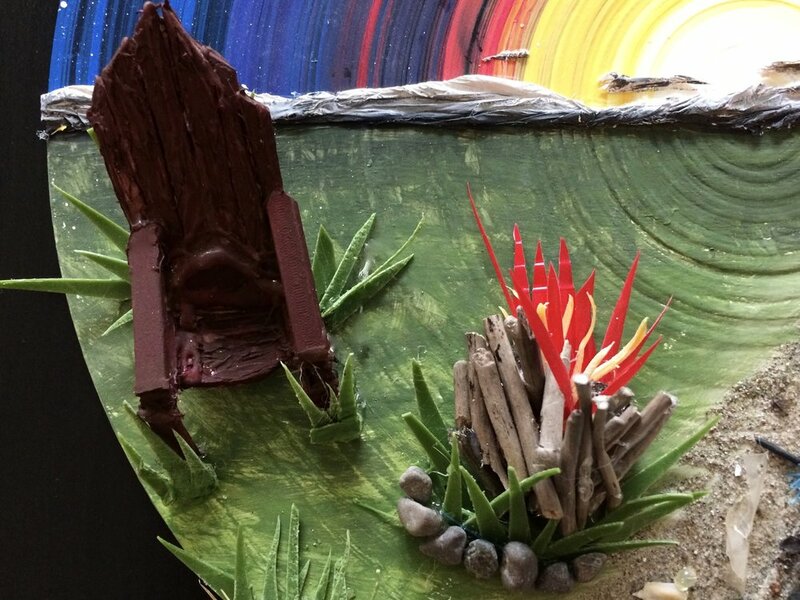 At the very bottom you'll see a piece of a bubble wand, the water and horizon are made of plastic bags, and the chair and fire are made of strips of plastic. A touch of nature has been added with the real beach sand and sticks. Next time you enjoy a day near the water take a minute to pick up a few stray pieces of litter. Future you will thank you! What kind of impact does litter have on fish? Science and research are just starting to find out the answers. Fish (and other wildlife) often mistake plastic for food. Since plastic has an affinity for oil it often attracts toxic chemicals which stick to the plastic that is then consumed. The increased toxicity bioaccumulates inside the fish which means those further up the food chain (humans and wildlife) consume these toxins when eating fish. So here we have a plastic bottle cap fish. A total of 6,302 plastic bottle caps were picked up along the shore of Lake Ontario over just 8 weeks in 2017 by A Greener Future volunteers. It took some cunning and creativity to get this fish into it's completed form. 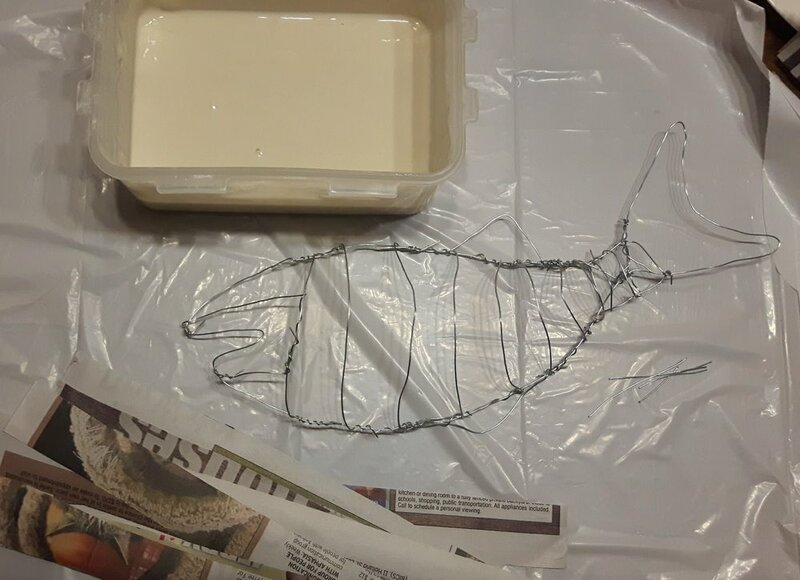 The base is a piece of wire which was covered with paper mâché. Plastic bottle caps were then cut up and hot glued onto the paper mâché. There were a few colourful words while cutting up the caps but in the end our artist won this battle. Straws were painted green to create the bed of lettuce, with fishing line as a herb topping. The plastic fork was picked up at Ashbridges Bay in Toronto. The overall theme for this pieces is food and the impacts that litter may have on the food chain. We go to the waterfront for many reasons. Lake Ontario holds strength, inspiration, and beauty. It's safe to say that the water is a place of solitude and joy for many. This canvas painting shows the beauty of the lake even with litter hidden beneath the surface. 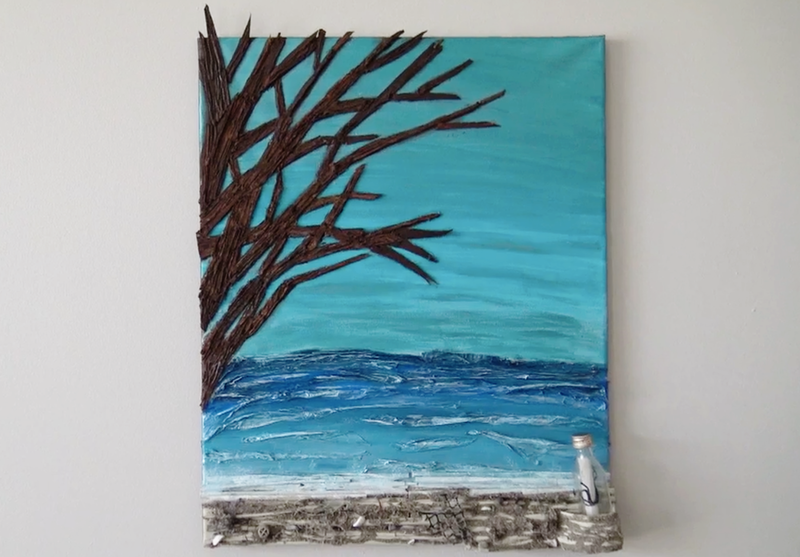 Plastic bags make up the water, straws lie under the beach front, and the tree is made out of cut up plastic pieces that have been painted and texturized. Within the beach sand you'll find debris, you might not spot it at first, but it's there, just like in reality. The message in a bottle is inspired by an actual event that took place in 2017. During a cleanup at Frenchman's Bay in Pickering a water bottle was found with a message in it. Rochelle sent a message to the writer who apologized for releasing the bottle as they hadn't considered it would end up being part of a beach cleanup. In the art piece the Greener Future mission is written on the parchment in the bottle. This is the message that needs to be adopted to help protect our lake, beaches, and surrounding environment. The overall theme for this piece is peace and tranquility as people often go to the water to seek relaxation and rejuvenation. Where will we go if this sacred space is polluted? Nine million people rely on Lake Ontario for drinking water. So what exactly are we drinking when we take water out of the lake? With illegal dumping, raw sewage bypasses, and factory effluents going directly into the lake it's hard to determine how many chemicals, toxins, and microplastics might be in our drinking water. 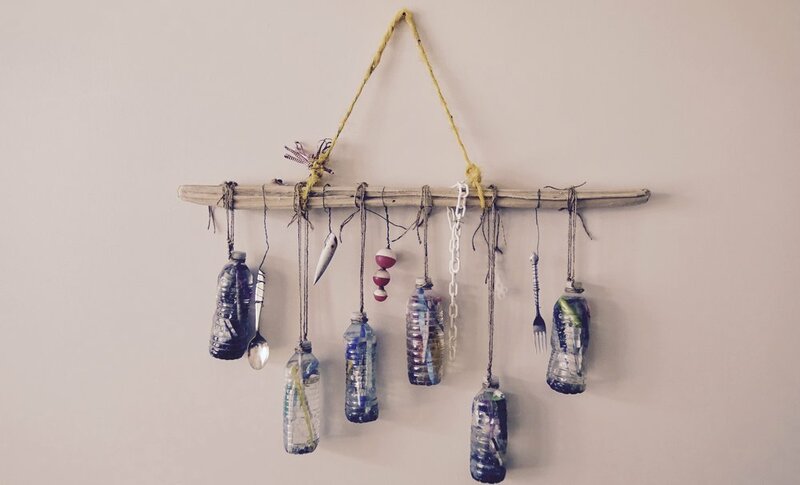 Our artists has created this drinking water mobile. Each bottle is filled with beach plastic and lake water. Hanging from drift wood by twine and wire, you'll see cutlery, bobbers, and fishing lures that were all found on the beaches of Lake Ontario. The piece is hanging by a piece of rope found in Ajax, Ontario. Some of the plastic pieces in the bottle include tampon applicators, straws, rope, utensils, packaging, shipping tags, a pen, shotgun shell wads, and unidentified pieces. The overall theme of this piece is drinking water and how it's contaminated by litter. Jennifer is a mother to a sassy three year old and an artist at heart. She does her art at night, without the distractions of motherhood, when her inner owl comes out. While she originally trained in aesthetics she found that it wasn't the career for her. Although, she's happy to visit a spa anytime. 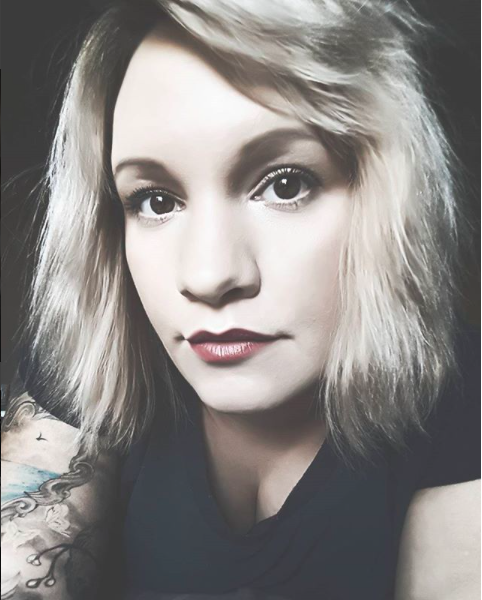 Jennifer is a happy traveller, and she'd love to travel more, maybe even get out and take a road trip in a winnebago somewhere. Visiting Prince Edward Island in 2017 was very inspiring for her, especially the hilltops and Anne of Green Gables. Art and photography are always on her mind as she's always seeking the opportunity for a good shot. Art keeps her mind busy and out of trouble and also pairs well with a nice glass of wine. "I spend a little bit of time at the beach, it's too crowded. But when I do go to the beach I notice there is a lot of unnecessary garbage, especially after the weekend. 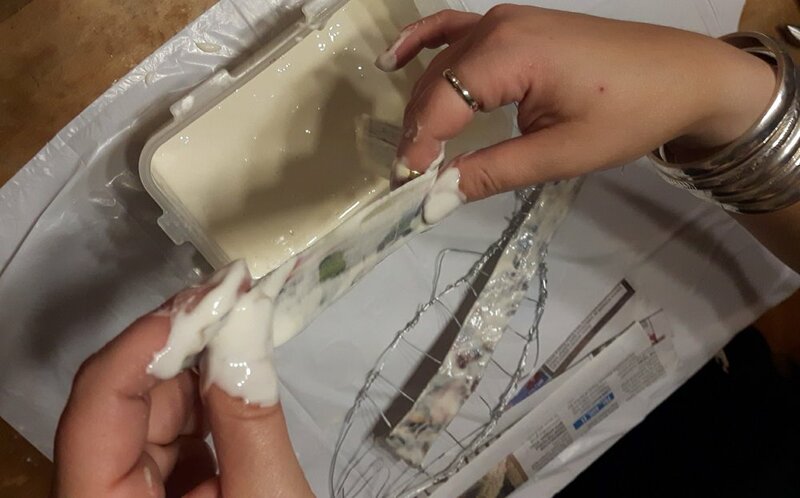 When I see strange and interesting materials that have come from the shoreline the creative process blossoms and the idea goes from my head to my hands."